Boris Vaksman began his fencing career in Odessa, Ukraine at the age of 14. After only 3 years Boris was awarded the title “Master of Sport.” One year later, at the age of 18, Coach Vaksman became Ukrainian National Champion and Soviet Union Championship, both of which he went on to win 3 times by the age of 21. In total, Vaksman earned an impressive 56 medals in International and Soviet competitions between 1978 and 1983. After moving to the U.S. in 1989 he began his coaching career in New York. 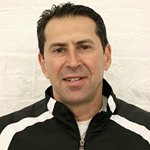 Since 2006 Boris Vaksman has been an Assistant Coach at St. John’s University. During his tenure at the University, Coach Vaksman has lead the Red Storm Fencing Team to one 3rd and three 2nd place NCAA finishes. His recent NCAA accolades include recruiting Ukrainian men’s epee fencer, Yevgeniy Karyuchenko, and coaching him to a 2014 Individual Championship title.